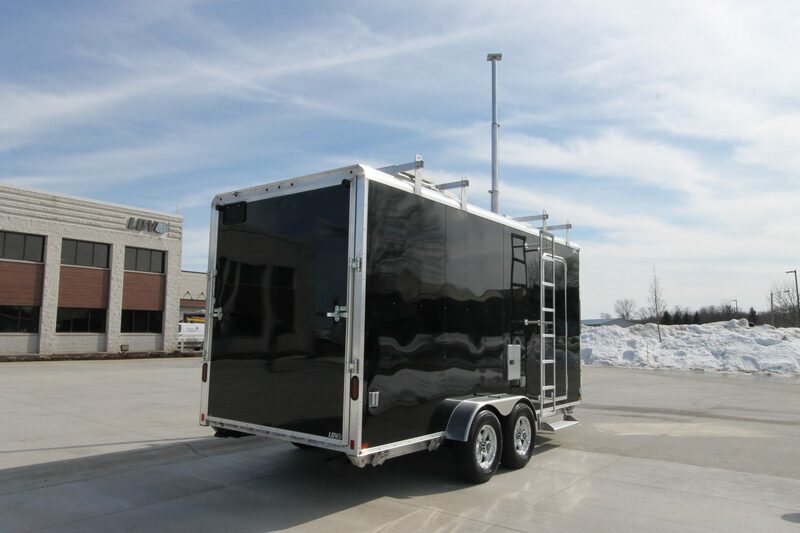 JBER ACE chose a 16' Triton chassis for their mobile command center trailer. This trailer chose to include three folding shelves into the design that can be stored vertically while the vehicle is in transit. Two workstations with task chairs, open framed electronics equipment rack, and 4 drawer legal sized cabinet have been added for staff. JBER ACE also chose to integrate custom fabricated aluminum cabinets and a magnetic dry erase board with clip frame for ease replacement. A rooftop access ladder has been mounted to the side of the vehicle while a telescoping mast was added to the exterior front nose of the trailer as well. This trailer also includes a ramp for rear entry access.